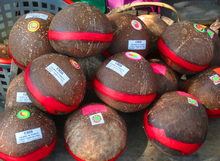 Kalamay from Bohol packaged inside empty coconut shells. Opened Kalamay inside the coconut shell. Kalamay (also spelled Calamay, literally "sugar"), is a sticky sweet delicacy that is popular in many regions of the Philippines. It is made of coconut milk, brown sugar, and ground glutinous rice. It can also be flavored with margarine, peanut butter, or vanilla. Kalamay can be eaten alone but is usually used as a sweetener for a number of Filipino desserts and beverages. Kalamay is a popular pasalubong (the Filipino tradition of a homecoming gift). They are often eaten alone, directly from the packaging. Kalamay is also used in a variety of traditional Filipino dishes as a sweetener, including the suman and the bukayo. It can also be added to beverages like coffee, milk, or hot chocolate. Biko and sinukmani are similar dishes which use whole glutinous rice grains. The preparation is the same except that the glutinous rice is first cooked whole and not ground into a paste, and then is smothered with the latík. In some regions (particularly in the Northern Philippines), this dish is referred to as the kalamay, with the viscous kind differentiated as the kalamay-hati. The latík from kalamay by itself can be used with other desserts, particularly with dishes made from cassava (which is then referred to as 'cassava kalamay'). Biko topped with caramel-like latik. There are many variations and types of kalamay. Kalamay can be divided roughly into two types: the syrupy kind used in conjunction with other dishes (higher latik ratio), and the gummy chewy kind which is more expensive and usually eaten on its own. Bohol Kalamay - Kalamay from the island of Bohol can vary from extremely sweet to mildly sweet. It is distinctive for being sold inside halved smooth coconut shells (the mesocarp of coconuts, locally known as bagol or paya). These containers are then sealed shut with a characteristic red crepe paper (papel de japon). This type of packaging is known as Kalamay-hati (literally 'Half Kalamay'). Baguio Kalamay - a type of Kalamay from Baguio City, Philippines. It is also known as Sundot Kulangot (literally 'Picked Booger') because of its consistency. It is sweetened with molasses which adds to its color. It is uniquely packed into halved pitogo (Sago Palm of the genus Cycas) shells and sealed with red crepe paper in a similar manner to the Bohol Kalamay. It is the smallest known traditional packaging of Kalamay. They are sold in bundles, several of these kalamay balls are nestled inside split bamboo and tied with a string. Iloilo Kalamay - Kalamay (also known as Kalamay-hati) from the province of Iloilo and the island of Negros. It is thicker in consistency than other types of Kalamay. The town of San Enrique celebrates a Kalamay festival. Candon Kalamay - Kalamay from Candon City, Ilocos Sur. It is sold wrapped in banana leaves or in coconut shells, though modern packaging uses polystyrene containers wrapped in cellophane. Candon City also celebrates a Kalamay Festival. Nilubyan or Iniruban- a kind of Kalamay made from pounded green rice. It originates from Camiling, Tarlac in the Northern Philippines. Mindoro Kalamay - a version of Kalamay from the island of Mindoro. It usually contains grated coconut and is flavored with peanut butter or vanilla. Indang Kalamay - Calamay Buna is a sweet delicacy of sticky rice, brown sugar and coconut milk that is well known in Indang Cavite. This variety of calamay from Indang is made from glutinous pulverized rice called malagkit mixed with coconut milk and panutsa. Kalamay, in many Visayan languages (particularly Hiligaynon), is synonymous with 'sugar' (extracted from sugarcane). The word is usually elided to kamay in modern Cebuano dialects. In the Waray language, kalamay refers to a hardened cake of molasses used as sweeteners for many cooked desserts. Its production has been known since the Spanish colonization of the Philippines. A cousin of kalamay is dodol, found in Indonesia, Malaysia, Brunei, Singapore and in some parts of the Philippines. It uses similar basic ingredients and preparation. Dodol, however, is a solid candy, unlike the liquid kalamay. Kalamay is visually similar to the Chinese nian gao (also known as tikoy in the Philippines), but they are not related. ^ a b c "Calamay from Bohol". marketmanila.com. 22 June 2010. Retrieved January 7, 2011. ^ Vicente Labro (2006-11-18). "'Kalamay'-making survives high-tech sugar mills". newsinfo.inquirer.net. Retrieved January 7, 2011. ^ a b c d e Edgie B. Polistico (December 18, 2010). "Pinoy Food and Cooking Dictionary - C". EDGIE POLISTICO’S encyclopedic PINOY dictionary. philfoodcooking.blogspot.com. Retrieved January 7, 2011. ^ "Municipality of San Enrique and the Kalamay Festival". iloilohangout.tigaswebs.com. 2008. Retrieved January 7, 2011. ^ "Calamay Buna, a Sweet Delicacy from Indang, Cavite". wowcavite.com. 2011. Retrieved March 31, 2015. ^ Jenny B. Orillos (June 21, 2010). "Sweet and Sticky Pinoy Treats: Our Top 10 Kakanin". spot.ph. Retrieved January 7, 2011.